Do you need a bigger file? The file available on this site is 650 x 1024 px. To obtain an alternate file type or higher resolution copy, please contact the owning institution. 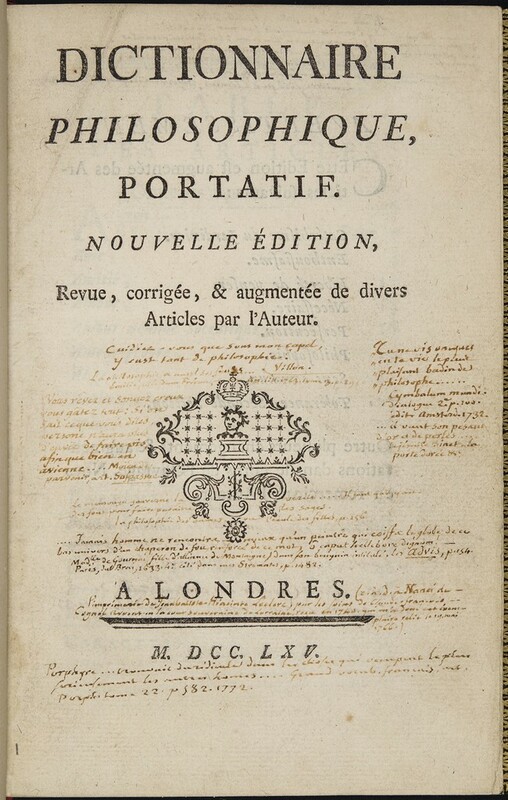 Scope/Content: 1765 copy of Voltaire's Dictionnaire philosophique with extensive annotations and underscoring throughout by Louis-François Jamet. Includes mention by Jamet of the printer on t.p. : "c.à.d. à Nanci de l'imprimerie de Jean Batiste Hiacinte Leclerc, par les soins de Claude-François Cognet avocat en la cour souveraine de Lorraine, reçu en 1740, qui m'a doné cet exemplaire relié le 19 mai 1766." Jamet's annotations provide commentary on the text, cross-reference other books (as well as Jamet's own notes and annotated volumes), occasionally correct the printed text, and augment Voltaire's Dictionnaire with additional entries, including those on Aaron, Baisers, David, Deluge, Diogene, and Merveilleux (among others). Scope/Content: On front free endpaper, in later hand: "Vente Potier, mars 1870. no. 283. "; formerly in the library of Claude Lebédel.